Sheep Measles occurs when dogs have access to raw or untreated sheep or goat meat. 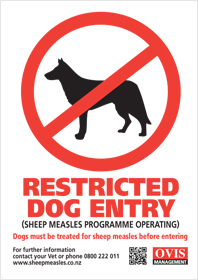 If taking a dog near sheep pasture the best method to ensure it is free of Sheep Measles to treat with praziquantel drugs within one month or at least 48 hours prior to going onto farm land. 1. If going on private land ask permission from land owner. 2. Dose all dogs with a praziquantel drug at least 48 hours or within one month prior to going. 3. Carry some evidence of treatment such as a treatment certificate or receipt from vet. Any decision to allow entry to a dog rests with the landowner. 4. Carry enough plastic bags to pick up and remove dog faeces should your dog defecate. If you are going on public land near sheep pasture please apply the same policies to prevent the spread of sheep measles. Feeding Sheep or Goat Meat to dogs. Any meat from sheep or goats should treated by freezing at -10°c for 10 days or cooking until brown throughout prior to feeding. Sheep or goat meat purchased from a butchers or supermarket CANNOT be guaranteed to be sheep measles free and should ALWAYS be treated before feeding to dogs.This includes any bones of offcutts designated as petfood.